Perched one thousand feet above the Amalfi Coast, Ravello is a town of ancient churches, narrow streets and luscious gardens. It is the sort of charming little place which ought to have a festival. And it does have one, which specialises in that most civilised of artistic forms – chamber music. Here, then, the brash and the vulgar have long been banished. 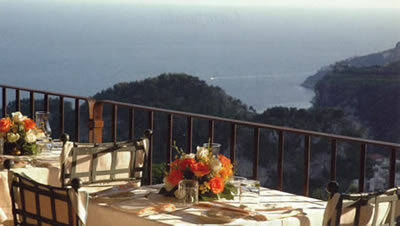 In Ravello you can expect courtesy, modesty and restraint. Its hotels reflect these characteristics. One of them was once the villa of the Marquis de Cinque. 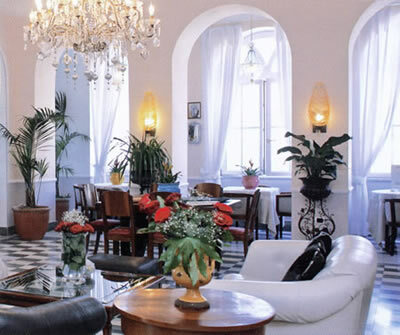 Now it is the Hotel Villa Maria, and it has been owned by the Palumbo family for four generations, since 1934. I decided to pay a visit. The climb from the Cathedral square, the centre of the town, took me a few minutes, for it can only be reached on foot. Others – little children, aged ladies and the like – scampered past me with the agility of mountain goats, but then they were probably used to the gradients in these parts. Still, slowly and carefully, I reached my destination. And a pleasing destination it turned out to be. (My luggage had gone via the Hotel Giordano nearby – which is under the same ownership – where there is parking, if you are driving yourself.) The first impression of the Villa Maria is most satisfying, for the garden is sweet and the public rooms are very handsome indeed – if, like me, you like your décor to be in the taste which I call ‘Traditional Refined’. Readers of Bown’s Best will want to follow my example and stay in the hotel’s best room. This is number 3 – the Suite, 356€-520€ a night, bed and breakfast for two, according to season – on the first floor, up a wide staircase. (There is no lift.) This large chamber – about 20 feet square – has been occupied by some famous guests, particularly in the 1930s. 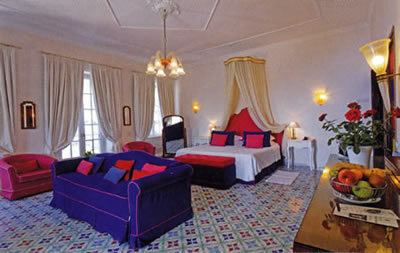 They will all, like me, have been charmed by its floor of Amalfi ceramic tiles, by its abundance of natural light and – through the French windows – by its large surrounding terrace (with views of cliffs and of the sea). I liked the current décor: the blue sofa and pink armchairs, the crystal chandelier and wall lights, the fine cheval glass and the superb Art Déco sideboard. There was fun, as well as elegance, about this apartment. The tiled bathroom was of modest size, but the tub (with shower over) accommodated me with comfort, the wash basin was capacious, and the loo and bidet were all present and correct. 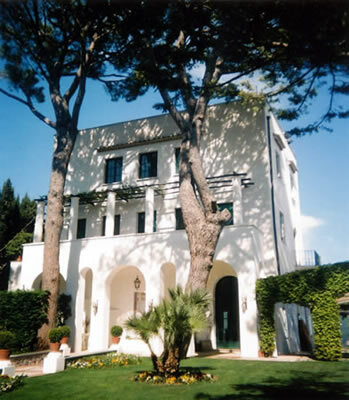 One joy of being at the Villa Maria is that one can stroll with relative ease – even for me – further upwards to the world-famous gardens of the Villa Cimbrone. Doing the walk from the Cathedral square in one go would have been far too much for my aged legs, but setting off from the Villa Maria made it easy. The view from the top will bring a smile to the grumpiest visage. 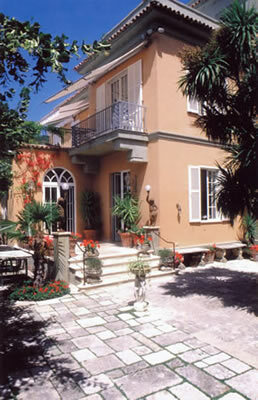 Even closer – in fact, only a few steps away – is the exquisite Villa Eva (pictured). Like the Villa Maria, it is owned by the Palumbo family. This Art Déco masterpiece is now used for weddings and receptions. It enjoys a remarkable panorama of the coast and should be visited. Back at the Villa Maria, my thoughts turned to food, so I went to the dining room. Or rather, I went to the dining rooms. The first was the expected high, rectangular chamber one finds in proper houses from the 19th century. But through this was the second, which was a long terrace, which could be enclosed in lower temperatures to become a sort of conservatory. Mercifully, the weather was fine, so my evenings were spent in the fresh air, at a table with a dramatic view over the valley and the distant sea. I settled myself into the metal armchair, adjusted its cushions, admired the crisp cream napery and the glasses by Bormioli and knew I had found a good place for dinner. 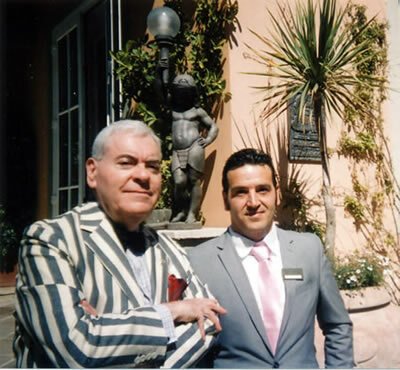 I was looked after with commendable efficiency by the Restaurant Manager, Angelo Cirella (pictured, with your correspondent). The wine list has 275 offerings. Most, apart from the champagnes (1999 Cristal is 430€), are Italian. Prices run from 19€ for a local white (made from the falanghina grape) to 1,500€ for the 1997 vintage of Sassicaia. Other super-Tuscans include 1999 Solaia (650€), 2012 Luce (170€), 2012 Ornellaia (340€) and 2014 Tignanello (250€). That ever-reliable white from Umbria, Cervaro della Sala, is 140€ in its 2010 vintage. My breakfasts were had at the same table as my dinners. But, in the mornings, the pleasant canned music – “These foolish things” was one of the songs – was replaced by the even more pleasant sound of birdsong. Pots of coffee and my daily, concluding cappuccino were brought to me, and from the buffet I secured muffins, brown bread, bacon, scrambled eggs, melon, pineapple and kiwi fruit. All of this food was good. I left as I had arrived – on foot. I had enjoyed my stay, for the Villa Maria is a haven for those who like good food, quiet calm and unruffled relaxation. But do stay in room number 3. Via Santa Chiara 2, 84010 Ravello, Italy. Double rooms from 135€-199€, bed and breakfast, according to season.